The people at Conflicts Forum, which is directed by former British diplomat and MI6 ‘ranking figure’ Alastair Crooke, sent me an unpublished article by Alastair and asked if the Automatic Earth would publish it. 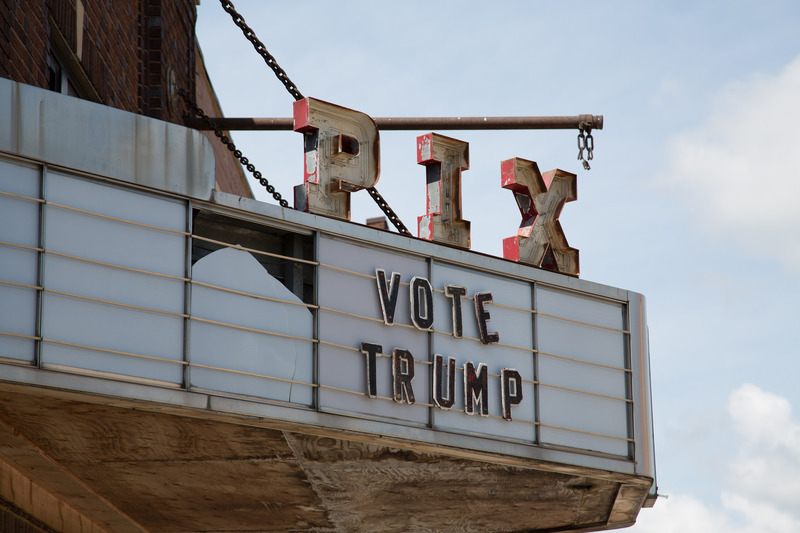 Since I like his work and I (re-)published two of his articles last year already, ‘End of Growth’ Sparks Wide Discontent in October 2016 and Obstacles to Trump’s ‘Growth’ Plans in November 2016, I’m happy to. His arguments here are very close to much of what the Automatic Earth has been advocating for years, both when it comes to our financial crisis and to our energy crisis. Our Primers section is full of articles on these issues written through the years. It’s a good thing other people pick up too on topics like EROEI, and understand you can’t run our modern, complex society on ‘net energy’ as low as what we get from any of our ‘new’ energy sources. It’s just not going to happen. Alastair Crooke: We have an economic crisis – centred on the persistent elusiveness of real growth, rather than just monetised debt masquerading as ‘growth’ – and a political crisis, in which even ‘Davos man’, it seems, according to their own World Economic Forum polls,is anxious; losing his faith in ‘the system’ itself, and casting around for an explanation for what is occurring, or what exactly to do about it. Klaus Schwab, the founder of the WEF at Davos remarked before this year’s session, “People have become very emotionalized, this silent fear of what the new world will bring, we have populists here and we want to listen …”. Dmitry Orlov, a Russian who was taken by his parents to the US at an early age, but who has returned regularly to his birthplace, draws on the Russian experience for his book, The Five Stages of Collapse. Orlov suggests that we not just entering a transient moment of multiple political discontents, but rather that we are already in the early stages of something rather more profound. From his perspective that fuses his American experience with that of post Cold War Russia, he argues, that the five stages would tend to play out in sequence based on the breaching of particular boundaries of consensual faith and trust that groups of human beings vest in the institutions and systems they depend on for daily life. These boundaries run from the least personal (e.g. trust in banks and governments) to the most personal (faith in your local community, neighbours, and kin). It would be hard to avoid the thought – so evident at Davos – that even the elites now accept that Orlov’s first boundary has been breached. But what is it? What is the deeper economic root to this malaise? The general thrust of Davos was that it was prosperity spread too unfairly that is at the core of the problem. Of course, causality is seldom unitary, or so simple. And no one answer suffices. 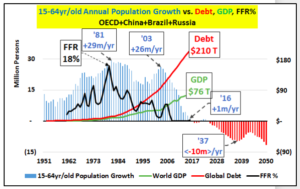 In earlier Commentaries, I have suggested that global growth is so maddeningly elusive for the elites because the debt-driven ‘growth’ model (if it deserves the name ‘growth’) simply is not working. Not only is monetary expansion not working, it is actually aggravating the situation: Printing money simply has diluted down the stock of general purchasing power – through the creation of additional new, ‘empty’ money – with the latter being intermediated (i.e. whisked away) into the financial sector, to pump up asset values. It is time to put away the Keynesian presumed ‘wealth effect’ of high asset prices. It belonged to an earlier era. In fact, high asset prices do trickle down. It is just that they trickle down into into higher cost of living expenditures (through return on capital dictates) for the majority of the population. A population which has seen no increase in their real incomes since 2005 – but which has witnessed higher rents, higher transport costs, higher education costs, higher medical costs; in short, higher prices for everything that has a capital overhead component. QE is eating into peoples’ discretionary income by inflating asset balloons, and is thus depressing growth – not raising it. And zero, and negative interest rates, may be keeping the huge avalanche overhang of debt on ‘life support’, but it is eviscerating savings income, and will do the same to pensions, unless concluded sharpish. But beyond the spent force of monetary policy, we have noted that developed economies face separate, but equally formidable ‘headwinds’, of a (non-policy and secular) nature, impeding growth – from aging populations in China and the OECD, the winding down of China’s industrial revolution, and from technical innovation turning job-destructive, rather than job creative as a whole. Connected with this is shrinking world trade. But why is the economy failing to generate prosperity as in earlier decades? Is it mainly down to Greenspan and Bernanke’s monetary excesses? Certainly, the latter has contributed to our contemporary stagnation, but perhaps if we look a little deeper, we might find an additional explanation. As I noted in a Comment of 6 January 2017, the golden era of US economic expansion was the ‘50s and ‘60s – but that era had begun to unravel somewhat, already, with the economic turbulence of the 70s. However, it was not so much Reagan’s fiscal or monetary policies that rescued a deteriorating situation in that earlier moment, but rather, it was plain old good fortune. The last giant oil fields with greater than 30-to-one, ‘energy-return’ on ‘energy-cost’ of exploitation, came on line in the 1980s: Alaska’s North Slope, Britain and Norway’s North Sea fields, and Siberia. Those events allowed the USA and the West generally to extend their growth another twenty years. And, as that bounty tapered down around the year 2000, the system wobbled again, “and the viziers of the Fed ramped up their magical operations, led by the Grand Vizier (or “Maestro”) Alan Greenspan.” Some other key things happened though, at this point: firstly the cost of crude, which had been remarkably stable, in real terms, over many years, suddenly started its inexorable real-terms ascent. And from 2001, in the wake of the dot.com ‘bust’, government and other debt began to soar in a sharp trajectory upwards (now reaching $20 trillion). Also, around this time the US abandoned the gold standard, and the petro-dollar was born. Well, the Hill’s Group, who are seasoned US oil industry engineers, led by B.W. Hill, tell us – following their last two years, or so, of research – that for purely thermodynamic reasons net energy delivered to the globalised industrial world (GIW) per barrel, by the oil industry (the IOCs) is rapidly trending to zero. Note that we are talking energy-cost of exploration, extraction and transport for the energy-return at final destination. We are not speaking of dollar costs, and we are speaking in aggregate. So why should this be important at all; and what has this to do with spiraling debt creation by the western Central Banks from around 2001? “You will notice two important trends in the chart above. When the U.S. EROI ratio was higher than 30:1, prior to 1970, U.S. public debt did not increase all that much. 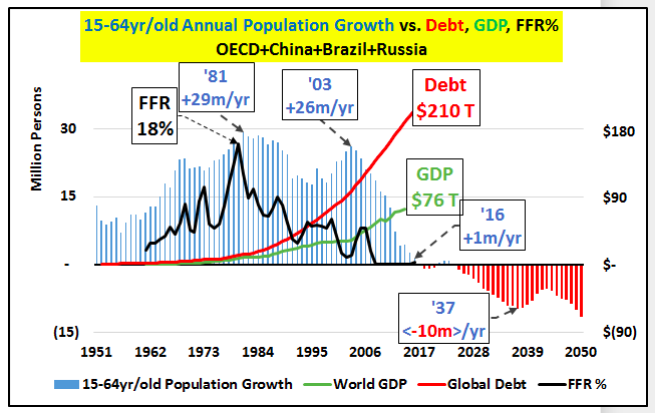 However, this changed after 1970, as the EROI continued to decline, public debt increased in an exponential fashion”. (St Angelo). 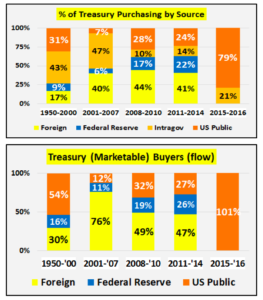 In short, the question begged by the Hill’s Group research is whether the reason for the explosion of government debt since 1970 is that central bankers (unconsciously), were trying to compensate for the lack of GDP stimulus deriving from the earlier net energy surplus. 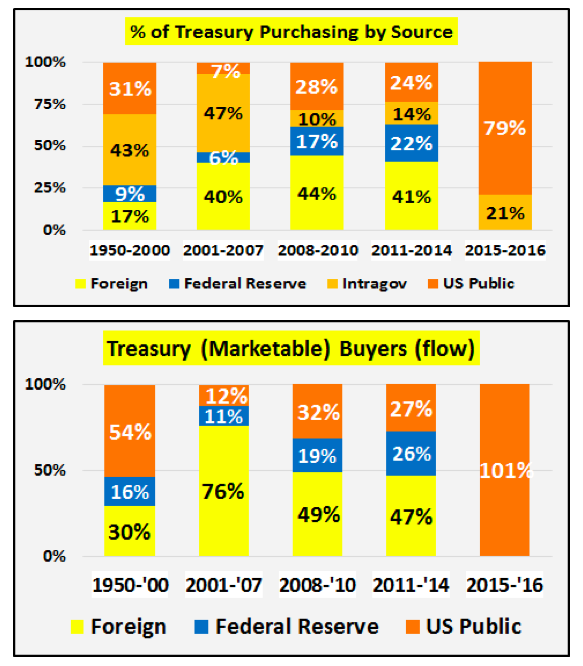 In effect, they switched from flagging energy-driven growth, to the new debt-driven growth model. Briefly, what does this all mean? Well, the business model for the big three US IOCs does not look that great: Energy costs of course, are financial costs, too. In 2016, according to Yahoo Finance, the U.S. Energy Sector paid 86% of their operating income just to service the interest on the debt (i.e. to pay for those extraction costs). We have not run out of oil. This is not what the Hill’s Group is saying. Quite the reverse. What they are saying is the surplus energy (at a ratio of now less than 10:1) that derives from the oil that we have been using (after the energy-costs expended in retrieving it) – is now at a point that it can barely support our energy-driven ‘modernity’. Implicit in this analysis, is that our era of plenty was a one time, once off, event. They are also saying that this implies that as modernity enters on a more severe energy ‘diet’, less surplus calories for their dollars – barely enough to keep the growth engine idling – then global demand for oil will decline, and the price will fall (quite the opposite of mainstream analysis which sees demand for oil growing. It is a vicious circle. If Hills are correct, a key balance has tipped. We may soon be spending more energy on getting the energy that is required to keep the cogs and wheels of modernity turning, than that same energy delivers in terms of calorie-equivalence. There is not much that either Mr Trump or the Europeans can do about this – other than seize the entire Persian Gulf. Transiting to renewables now, is perhaps too little, too late. 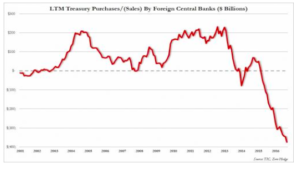 And America and Europe, no longer have the balance sheet ‘room’, for much further fiscal or monetary stimulus; and, in any event, the efficacy of such measures as drivers of ‘real economy’ growth, is open to question. It may mitigate the problem, but not solve it. No, the headwinds of net energy per barrel trending to zero, plus the other ‘secular’ dynamics mentioned above (demography, China slowing and technology turning job-destructive), form a formidable impediment – and therefore a huge political time bomb. A race to the bottom in pay levels? Italy should undercut Romanian salaries? Maybe Chinese pay scales, too? This is politically naïve, and the globalist Establishment has only itself to blame for their conviction that there are no real options – save to divert more of the diminished prosperity towards the middle classes (Christine Lagarde), and to impose further austerity (Dimon). As we have tried to show, the era of prosperity for all, began to waver in the 70s in America, and started its more serious stall from 2001 onwards. The Establishment approach to this faltering of growth has been to kick the can down the road: ‘extend and pretend’ – monetised debt, zero, or negative, interest rates and the unceasing refrain that ‘recovery’ is around the corner. It is precisely their ‘kicking the can’ of inflated asset values, reaching into every corner of life, hiking the cost of living, that has contributed to making Europe the leveraged, ‘high cost’, uncompetitive environment, that it now is. There is no practical way for Italians, for example, to compete with ‘low cost’ East Europe, or Asia, through a devaluation of the internal Italian price level without provoking major political push-back. This is the price of ‘extend and pretend’. It has been claimed at Davos that the much derided ‘populists’ provide no real solutions. But, crucially, they do offer, firstly, the hope for ‘regime change’ – and, who knows, enough Europeans may be willing to take a punt on leaving the Euro, and accepting the consequences, whatever they may be. Would they be worse off? No one really knows. But at least the ‘populists’ can claim, secondly, that such a dramatic act would serve to escape from the suffocation of the status quo. ‘Davos man’ and woman disdain this particular appeal of ‘the populists’ at their peril.